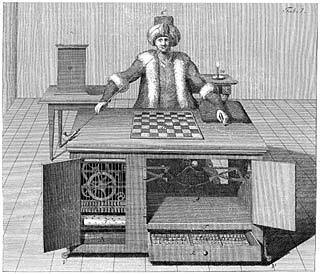 The Mechanical Turk was a fake chess-playing machine constructed and unveiled in 1769 by Wolfgang von Kempelen to impress the Empress Maria Theresa of Austria. The automaton consisted of a life-sized model of a human head and torso, dressed in Turkish robes and a turban, mounted behind a large cabinet housing a clockwork machinery. On top of the cabinet stood a chessboard. Following the death of Wolfgang von Kempelen in 1804, his son sold the Mechanical Turk to Johann Nepomuk Mälzel, (he patented the metronome, invented by Dietrich Nikolaus Winkel) who took it on tour around the world. The chess-player was a mechanical illusion that allowed a human chess-master hiding inside to operate the machine. The director avoided detection by moving forward or backward on a sliding seat when the cabinet doors were opened in proper sequence. For nearly 85 years the Mechanical Turk won most of the games played during its demonstrations around Europe and the United States. Johann Nepomuk Mänzel died at sea in 1838 and the Mechanical Turk changed hands several times. Finally the automaton was donated to Nathan Dunn’s Chinese Museum in Philadelphia where it was destroyed during a fire in 1854. Jane Irwin, a self-published comic creator, writer and artist from Kalamazoo, Michigan, retold the story of the Mechanical Turk in her newest graphic novel Clockwork Game. The project was succesfully funded on October / November 2013 on Kickstarter. I was one of the (humble) backers and supporters of the project. 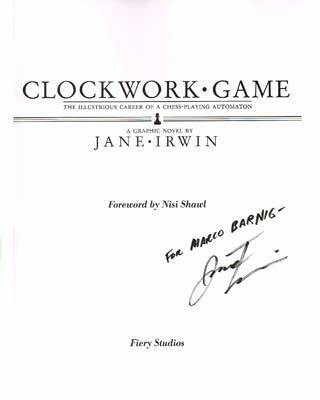 I received today my personalized copy of the trade paperback of the Clockwork Game. It’s a beautiful artwork. The novel is a historical fiction, but it sticks very close to the historical facts. The story starts in May 1769 in Schönbrunn, Vienna, when Herr von Kempelen presents his chess-automaton to her Majesty, Empress Maria Theresa. The story ends in July 1854 when the Mechanical Turk is destroyed in the fire touching Dunn’s Chinese Museum in Philadelphia. Échec was the last word of the machine. The name Mechanical Turk is also used by Amazon for it’s crowdsourcing Internet platform that enables requesters to co-ordinate the work of humans to help the machines of today to perform tasks for which they are not suited. This Amazon Web Service (AWS) labelled MTurk was launched in November 2005. Small tasks are posted as HIT’s (Human Intelligence Task) by the requesters (individuals or businesses) at the marketplace for work. Turk Workers (also called Turkers) can browse the available HIT’s and execute them (if they are qualified) for a monetary payment set by the requesters. The average wage for completing tasks is about one dollar per hour. MTurk is also used as a tool for artistic or educational exploration. One example is Aaron Koblin‘s collaborative artwork The Sheep Market displayed, among others, at the Hall of Fame of Digital Art at Leslie’s Artgallery. Napoleon Bonaparte Chess Game vs The Turk – The most famous person ever to lose to a machine! Supercomputers were introduced in the 1960s and were designed primarily by Seymour Cray at Control Data Corporation (CDC), and later at Cray Research. While the supercomputers of the 1970s used only a few processors, in the 1990s, machines with thousands of processors began to appear and by the end of the 20th century, massively parallel supercomputers with tens of thousands of “off-the-shelf” processors were the norm. ChipTest, Deep Thought and Deep Blue were chess computers. The chess project was started at Carnegie Mellon University by Feng-hsiung Hsu in 1985. He and his collaborators were hired by IBM Research in 1989 to continue their work to build a chess machine that could defeat the world champion. On May 11, 1997, Deep Blue, with human intervention between games, won the second six-game match against world champion Garry Kasparov by two wins to one with three draws. Blue Gene is an IBM project aimed at designing supercomputers that can reach operating speeds in the petaFLOPS range, with low power consumption. The initial design for Blue Gene was based on an early version of the Cyclops64 architecture, designed by Monty Denneau. The project created three generations of supercomputers, Blue Gene/L, Blue Gene/P, and Blue Gene/Q. In 2004, the first IBM Blue Gene computer became the fastest supercomputer in the world. Watson is an artificial intelligence computer system capable of answering questions posed in natural language, developed in IBM’s DeepQA project by a research team led by principal investigator David Ferrucci. Watson was named after IBM’s first president, Thomas J. Watson. In 2011, as a test of its abilities, Watson competed on the quiz show Jeopardy!. Watson had access to 200 million pages of structured and unstructured content consuming four terabytes of disk storage including the full text of Wikipedia, but was not connected to the Internet during the game. IBM describes Watson as “an application of advanced Natural Language Processing, Information Retrieval, Knowledge Representation and Reasoning, and Machine Learning technologies to the field of open domain question answering“. IBM’s DeepQA technology is used for hypothesis generation, massive evidence gathering, analysis, and scoring. Watson is related to Artificial Intelligence and to the research of commonsense knowledge, the collection of facts and information that an ordinary person is expected to know.